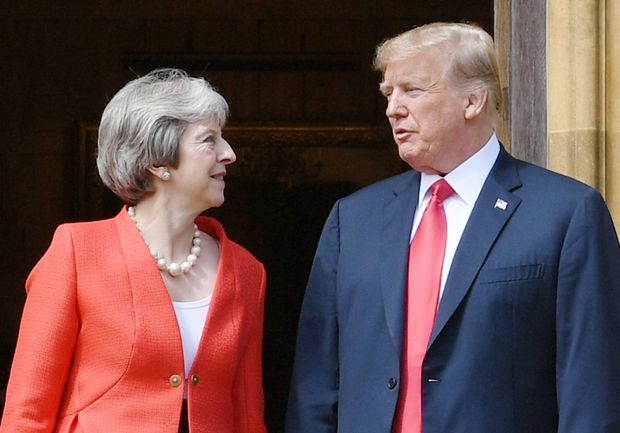 British Prime Minister Theresa May and U.S. President Donald Trump stand together upon Trump’s arrival for a meeting at Chequers, the PM’s country residence, on July 13, 2018. After leaving Chequers, Trump travelled to Windsor Castle to to have tea with Queen Elizabeth. He was heralded by military bands on his arrival at the 92-year-old monarch’s home where her grandson Prince Harry married U.S. actress Meghan Markle in May.